PROTECH GROUP was established to facilitate the work of executives directors and business managers in various business fields such as, industry, trading and service areas, including non-profit organizations (NGO) and government institutions through providing the best IT solutions in the field of applied software, intelligent management solutions, local networks, telecommunications and Internet services, and provide this solutions , systems and infrastructure to meet the latest technologies in the most advanced work field in the world. Data Center services according to the international standards "Tiering"
PROTECH GROUP offers satellite interconnection service by (VSAT) system through a network that uses different techniques to communicate with the satellites to transmit data and connect to the Internet fast and reliable manner. VSAT service provides a huge potential for the expansion of speed in line with the business environment. As a result of the flexibility of the service, you can assembly the station rapidly to support the expansion of the network to any site, regardless of how far away your site. In addition, our technical support staff has considerable experience in the VSAT service. by supporting your business with satellite interconnection service VSAT, you can get an Enterprise Wide Networking with high reliability and the possibility of good access to the information extends to distant regions, which will give you more flexibility and the ability to access connectivity solutions, ensure that you will always be in touch with where they are and at any region where fixed or Mobile communications services are not available.in addition, the technical support team available 24/7. Protech Group helps organizations and companies by providing a range of low-cost services. Businesses under current circumstances requires reliable and scalable connectivity to achieve business objectives. - Main DWDM technology systems. - Management of fiber optic networks. - Oil & Gas Companies. The Operations Centers Management provides infrastructure, networks, databases and management to provide systems, software, hardware and communication services to companies. The Department also applies the best techniques available in the labor market to meet requirements of client business through global methodologies and frameworks to achieve the desired objectives, In a high level of efficiency and impact. In addition, we provide our customers with partial and complete hosting services in advanced countries, and provide all our customers the technical support services they need to ensure the continuity of the network and technical infrastructure Information. - Reduce the risk of potential threats to the lowest level. - A team of experts in information technology. Our company offers a variety of specialized mobile applications for corporate solutions and general services. We can develop any kind of applications for Android and iOS for iPhone and iPad. In addition, we have developed a variety of software solutions to automate the business of both private and public sectors. We focus on developing business environment and data collection to simplify business process optimization and provide information to decision makers in a simple way that enables them to manage their daily and strategic business Easily and scientifically. Satellite TV services are an old technology. We are the first in Syria to provide this service by providing an enjoyable and suitable television viewing for the various age groups over the Internet, which offers the participant a great experience in choosing the programs he wishes to follow. The subscriber will find a huge library of thousands of films and series, foreign and Arabic to enjoy and get rid of advertising breaks, you can also enjoy a selection of the most beautiful channels of sports broadcast and follow the most important international patrols in football. In the last decades, Building Intelligence (BI) has become a widespread concept applied in different types of buildings of diverse scales. Whether a building is intelligent in terms of its performance, services, systems or all of the three aspects combined, the aim of BI is to enhance the comfort and safety of the occupants, and at the same time enable them to acquire a high level of control over the various parameters that can determine how healthy the environment inside a building is. Consequently, BI not only enhances the productivity and the wellbeing of the users (building occupiers), but also helps to achieve resource efficiency, cost effectiveness, flexibility and adaptability. Moreover, BI is recently being intertwined with sustainability concepts (incorporating green buildings in the context) as means to achieve energy conservation requirements of today due to ambitious targets set by many countries around the world. - Communications: telephone, Internet and video use. - Security: surveillance via surveillance cameras. - Energy saving and resource control. - Management and use of parking lots. - Operation and management of facilities. - Billing services for modern and updated facilities. - Security surveillance cameras: The surveillance cameras must be on duty around the clock and during low or high illumination and provide high-resolution images. - Digital Video Recorders: The group offers a wide range of digital video recorders with 4 to 16 audio and video inputs for different applications. 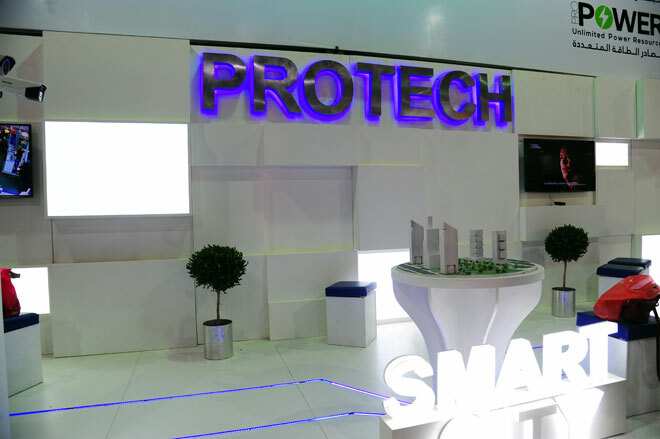 Protech Group specializes in burglar alarm systems and internal and external intrusion on walls with infrared sensors or micro sensors which connected to central and control management panels. We also study and supply fire alarm systems that are subject to the highest standards of inspection and European quality certificates. In addition to alarm systems and environment monitoring such as humidity sensors, heat, water leakage, fuel level and others. All of these systems can be linked to a central monitoring system to provide 24/7 surveillance service. Protech Group meets the diverse needs of individuals, business organizations and establishments through its Internet service provider "PRONET "the latest Internet service provider in Syria, offering a range of integrated technology and solutions designed to meet the diverse needs of individuals, businesses and customers. Which range from small to large-scale applications. It also supports a range of copper and fiber-optic technologies as well as full support for Internet, data transmission, hosting and IPTV services. - Group communication using the Internet Protocol. We put our expertise in the service of our clients. The establishment of a data center according to the international standards is one of the main requirements for companies that provide non-stop services 24/7. We offer these services in cooperation with the renowned Belarusian AVI Prom export company in this field. Professional Communications Services & Technologies PROTECH owner of ISP PRONET license for the provision of regular television channels and encrypted through the domestic Internet service ADSL the license was signed by the Director of the Telecommunications Regulatory Authority Dr. Abba Aweishek and General Manager of PROTECH Group MR. komi Hilal , Mr. Hilal explained that this license will allow Protech to start broadcasting regular and encrypted TV channels such as sports channels for all domestic internet subscribers in Syria via ADSL, The service will be launched immediately for a trial period, with the official launch date announced at the beginning of next December 2017. Mr. Komi Hilal said that subscription rates will be accessible to everyone. Everyone has the right to enjoy watching games and television programs at a reasonable cost. The company is interested in providing the service through Internet service providers and all subscribers, which constitute a real added value and an enjoyable experience for the subscriber to watch all the television channels that he wants to follow. Mr. Khalil Baza, the project manager, explained that there are many excellent services that will be launched in succession after the actual launch of this service in early December. Basmet Shabab souria has signed a Memorandum of Understanding (MoU) with PROTECH, sponsored by the Ministry of Social Affairs and Labor, which has signed a similar agreement with Al-Bassama to activate a "recruitment project"
Minister Rima Al-Qadri pointed out that the agreement is the first of its kind to realize the vision of moving the labor market and absorbing the largest number of job seekers to support the private sector, especially after the production wheel has returned to many facilities and meet the requirements. Dr. Tarek Rifai, Executive Director of PROTECH, expressed optimism about the agreement to support the Syrian society, especially the youth, families of the martyrs, the wounded and the volunteers, to create an incubator environment for responsible young people to support projects. In conjunction with the readiness to support several projects "Employment Project" portal through the rehabilitation of service centers belonging to Basmet Shabab souria, which exceeded the / 70 / center in all provinces where will be securing employment opportunities in addition to provide training to reach the stage of tender. Under the patronage of the Ministry of Social Affairs and Labor, the signing ceremony of a cooperation agreement between the Basmet Shabab Souria and the Professional Communications Services and Technologies Company (PROTECH) was held on Wednesday 18/10/2017. Within the recruitment project which is one of the projects of the program Ghadi with the Syrian Labor Market Observatory Syrian Chamber of Commerce and Chamber of Industry of Damascus and its countryside in addition to a circular issued by the Ministry of Tourism for all tourist facilities. Head of the Secretaries of Basmet Shabab Souria, Mr. Anas Mohammed Yunes, told Dam press: We are very happy today to obtain a patent for the recruitment project, which is one of the projects of the institution, which was officially launched in the date of 2017/1/10 The goal was to find a real workshop between the registered job seeker and the leading companies and employment, in view of the current crisis in our country, many people have lost their jobs. Therefore, a large number of experts and Syrian elites have been forced to change their place of residence and residence, which has caused them great difficulties in finding suitable work for them. Also, most of the major companies and factories suffered during the crisis years from a lack of appropriate scientific expertise and competencies, so it was a recruitment project aimed at helping them communicate among themselves. Nizar Abdel Baqi, recruitment project manager and member of the Board of Directors of Basmet Shabab Souria told Dam press: Since the start of the first 9 months we have been following up daily and we are trying to build new partners so we can benefit from the project because it benefits the private sector in general and also benefits the people who are looking for work in particular. Many of the telecommunications companies participating in the Damascus International Fair in its 59th session were characterized by technological services, satellite communication technologies, security systems and software. In a statement to the year confirmed the director of the Protech Group, Said the exhibition was an opportunity to showcase the range of services offered by the Internet provider Pronet and the after sales service, the group also has Prosat for Satellite Communication Technologies, which was one of the solutions that facilitated the work of banks, factories, companies and the commercial sector in the governorates where the infrastructure was damaged by events in Syria. the technical director of the group Ibrahim Smadi said that the group provides software services and information systems for universities such as student affairs, examinations and management, stressing the importance of participating in the exhibition because it constitutes an important economic breakthrough and a message to the world that Syria is okay and has begun reconstruction. 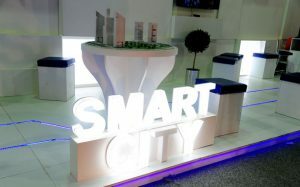 Smadi pointed to the smart city service provided by the company in addition to the smart home service where the sensors and systems are placed control lighting and electricity and cameras surveillance homes can be connected to the application on the mobile.